Under the helm of Stephen Pimbley, an award-winning international architectural consultancy SPARCH has over the last 10 years delivered a diverse range of landmark projects from its studios in Abu Dhabi, Beijing, Malaysia, Shanghai and Singapore. During his short visit to Jakarta, Pimbley shared with Indonesia Design contributor Aulia R. Sungkar his design philosophy and architecture concept as well as his projects that have gained worldwide recognition across Asia. You have successfully worked on a number of internationally acclaimed projects. What is your most favourite one? All the projects that I have completed or those I am currently working on have their own characteristic and uniqueness. 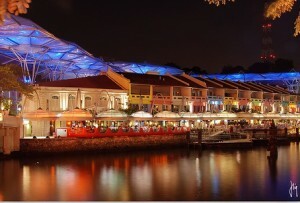 Clarke Quay in Singapore is one of my most memorable. It’s our first major project in Asia where I together with William Alsop worked with CapitaLand, one of Singapore’s largest real estate companies, transforming the ideas into the S$ 88 million redevelopment project of Clarke Quay’s river front district. The revitalized Clarke Quay was completed in 2006 and has won several accolades both locally and internationally as the best tourism destination and the most sustainable project. What are your other award winning projects? 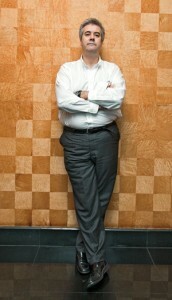 Several of my projects before I established my presence in Asia have won awards. Among them are Le Grand Bleu in Marseille, France and The Public in West Bromwich, U.K. The award winning projects in Asia worth the attention are Raffles City in Beijing and Shanghai Port International Cruise Terminal. Completed in 2009, the 150,000 sqm Raffles City conjoins retail, residential and commercial sites into a mixed-use development. We in 2004 appointed as architect and master planner for the US$200 million budget of the Shanghai Port International Cruise Terminal. The project with total construction area of 260,000 sqm has already been operated as the Shanghai’s largest passengers cruise terminal accommodating three 80,000-tonne cruise ships. Built along Huang Pu River waterfront, this development is facilitated with cafes, restaurants, office buildings and a hotel. Besides Raffles City in Beijing, you have also worked on two other Raffles City projects with CapitaLand. Can you tell more about these projects? Singapore was initially designed by noted architect I M Pei. We reshaped the interior and added more shops. Raffles City Beijing stands out in the city’s most strategic crossroads. This mixed-use development consists of retail podium, residential apartments, Beijing Ascott serviced residence and commercial office tower. Raffles City Ningbo is still under construction. This new generation of Raffles City is expected to complete in 2012. You recently completed 1 Mont’ Kiara Mall as your first major project in Malaysia. We would like to know more about this. 1 Mont’ Kiara Mall in Kuala Lumpur is one of the most recent and SPARCH’s first major project in Malaysia, which opened its door to public since end of 2010. 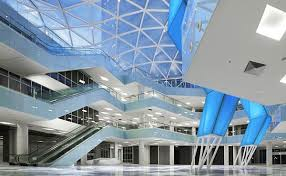 We were commissioned to design the roof and interior, and have incorporated unique design concepts on the 40,000 sqm of retail space that spreads over five levels. As for the roof, we use Ethylene Tetra Fluoroethylene (ETFE) in the construction of triangulated transparent canopy. The use of ETFE allows the stream of natural sunlight, thus reducing the need for the electricity generated light. The mall is an integral part of 1 Mont’ Kiara mixed-use development project that will include offices and serviced apartments. How about your project in Indonesia? The 75,000 sqm Paragon City in Central Java, Semarang is our Indonesia’s first and so far the only project. Developed by Golden Flower Group Real Estate, this mixed-use development comprises of a 7-storey retail podium with 2 basement levels. The podium houses the city’s largest shopping mall, hyper mart, a hotel and convention centre. It’s a very ambitious project by a new developer with full potential in the real estate industry. We started the project about four years ago with the completion end of last year. And I’m happy to see the biggest building in Semarang as the city’s new icon. 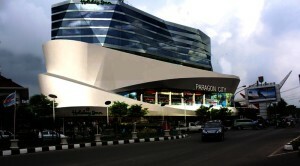 How do you perceive the Paragon City’s project with your other projects outside of Indonesia? No different at all. The process in which we work closely with clients and team as well as local architects in Semarang is the same as any other cities in Asia. Our client in Semarang started off with manufacturing garments and had a lot of retail businesses involved with. And we’re trying to bring this idea into our project. If you visit Paragon City, you’ll see that the skin of the building resembles typical shopping street on Orchard Road in Singapore or Oxford Street in London. I see that most of your projects are mixed-use development. How do you see the prospect of such a development? It has a very good prospect, indeed. Many development companies in China are now building mixed-use developments. People are looking for a solution where working, living, shopping and entertainment are integrated into one destination. Such solution is best suited for people living in big cities, especially like Jakarta where commuting for one place to another can take hours. What is the concept of SPARCH in creating a mixed-use development? As I mentioned before, a one-stop living where all the amenities are facilitated within reach. In addition, the development should be uniquely built in sustainable places. People always talk about green building, green architecture and so on. Green building is just a part of sustainable architecture. A sustainable real estate should therefore include such elements as the use of eco-friendly materials, environmentally sustainable design and the philosophy of designing interiors and exteriors. That’s what I call “Conviviality of Space”. I like big space with large rooms, and the outside space is part of the interior. I always pay attention to the needs of natural sunlight. My ideal space therefore includes a big building flooded with daylight. I’m not a great believer in minimalist. Somehow, to me, minimalist is a rather excuse for low quality architecture even though I’m aware that there are some architects who build great minimalist spaces. As for me, I am a maximalist! By Aulia R. Sungkar. Published in Indonesia Design, May-June 2011.